We managed to make it a Titanfall midnight launch party, here are our impressions. One of the most anticipated games of the year and potentially the first major next-gen exclusive, Titanfall is on everyone’s radar, Xbox One owner or not. Threatening to revolutionize the first-person shooter scene with the promise of a level of depth in gameplay never before seen in the genre, the hype seems all but justified. 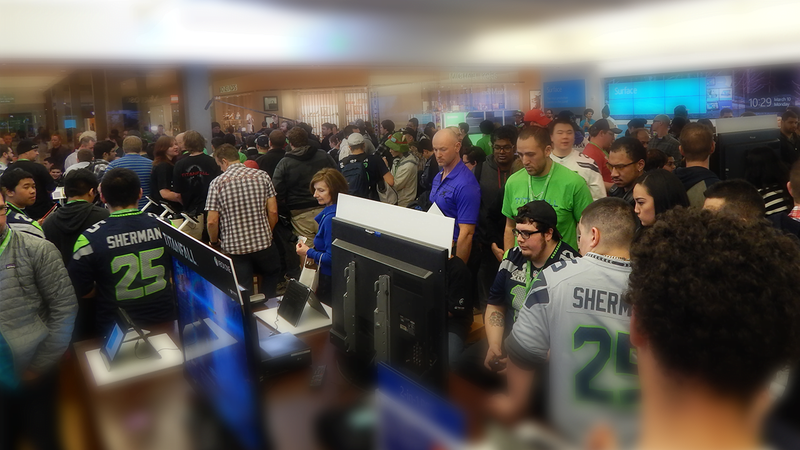 I managed to make it to the Titanfall midnight launch party in Microsoft’s Bellevue, WA store. Upon arriving, I was dismayed by the still-growing line to enter the store. A few dozen people stood before me and the party. I took my Nikon out, wrapped the lanyard around my neck, and approached the employee admitting people in. “I’m with the press,” I said. It was a shot in the dark and my lack of a press badge didn’t help my case, but it worked. With a nudge of her head I was in. I was greeted by local radio DJs in the corner blasting Top 40 tunes over the speakers. I joined my friend as we meandered around the party, taking in the sights. Everywhere you looked, you saw Titanfall. Stations were set up all around the store for curious potential customers to get a taste of what the shooter had to offer. As I began exploring the show floor, I overheard a raffle going on. After procuring a few tickets, I approached the man reading off the numbers. Charismatic and engaging, he led Titanfall chants in between reading the tickets. The energy was palpable when he would proclaim, “When I say Titan, you say fall!” prompting the entire store to erupt in a chant. With a camera crew fixed upon him, he read off prize after prize. Neither my friend nor I won anything, but it was still amusing to watch. 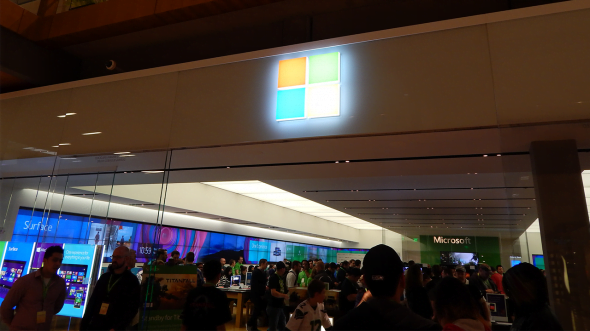 Microsoft pulled out all stops in making this launch party an entertaining and informative experience. 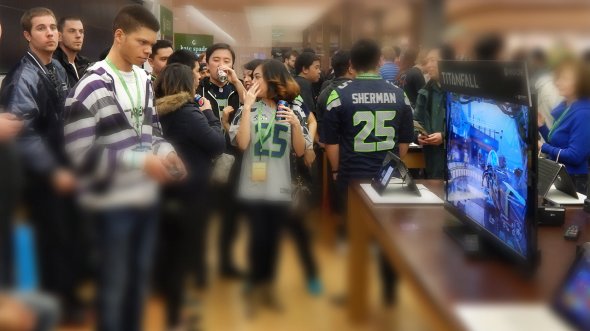 Including the many Titanfall showcases, patrons had could toy with the latest phones, tablets, and computers that Microsoft has to offer. There was even a 3D printer printing off toy castles and twenty-sided dice, much to the amazement of passersby. Before I arrived, Seattle Seahawks star Richard Sherman spent some time with the crowd, offering autographs and photos. The intensity was unlike any midnight launch I have ever been to. Finally, it was my time to play. I had tried Titanfall once for a few minutes while I was attending PAX Prime back in the fall. I was left unimpressed at the time. I know now that this was because a few minutes aren’t enough to do the game justice. I was allowed three deaths before I had to pass the controller. Over the course of about ten minutes, I wall jumped to a vantage point to take out a few soldiers, rodeoed a Titan, and engaged in a heart-stopping Titan on Titan battle. The fast-paced gameplay, unseen maneuverability, and implementation of Titans portray Titanfall as an immensely unique standout in a genre that has become stale over the past few years. The standard could very well be set with the release of this ambitious shooter, just as it was when Call of Duty 4 was released in 2007. As the hour to launch drew closer, the raffle prizes became better and better. 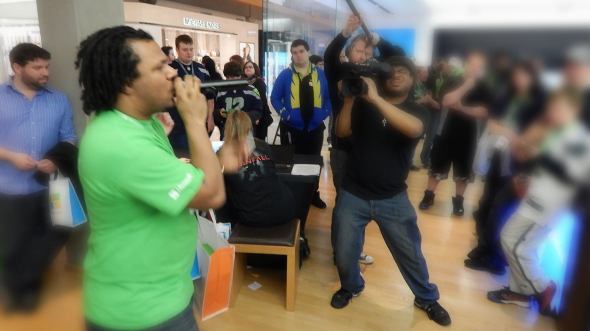 The prizes went from Titanfall strategy guides to headsets to sound bars to Xbox Ones. The crowds grew thicker and tensions rose as lines began to form near the checkout counter. I left just minutes before the sale embargo lifted, in order to avoid traffic and being trampled, but I was left knowing that Titanfall was gearing up to be the FPS game Xbox One owners were hoping it to be. Be sure to check back to read our official review in the coming days. Dimitri is a busy fella living, working, and going to school near Seattle, Washington. Video games and writing are his passions and he hopes to combine them into a career one day.